A rail firm has become the first to announce a freeze on 43 per cent of its fares for 2014 - including more than half of journeys to and from London. 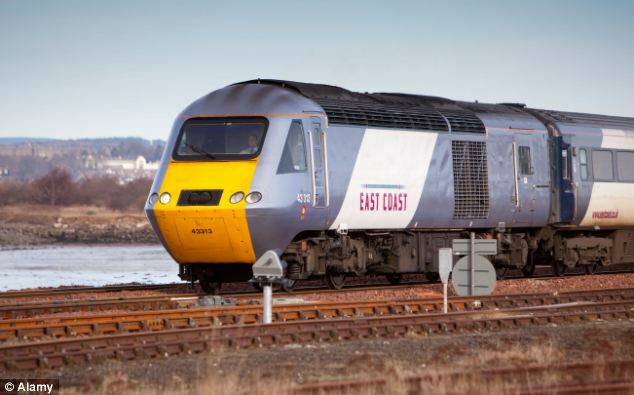 But Government-run East Coast, which runs to the North East and Edinburgh, said regulated fares, which include season tickets, will rise by 3.1 per cent. This is in sharp contrast to the oft-quoted ‘real terms freeze’ in which fares go up only by the rate of inflation - which still means ticket prices rise. The company said there would be some increase below or up to the rate of inflation on 51 per cent of fares. And 6 per cent of tickets would see an above inflation rise, it said. The line was taken over by the Department for Transport in 2009 after franchise holder National Express decided it cost too much to run. East Coast managing director Karen Boswell said: ‘We’re freezing fares to encourage more people to travel with us. This will help us to continue to grow our business, and to give back even more to the taxpayer. ‘This is a straightforward commercial decision which is very good news for our customers and businesses across our route. It will also help East Coast to sustain our strong advantage in a highly-competitive travel market. 'When you take into account the rate of inflation, the announcement represents a genuine real terms cut in our overall fares. East Coast operates services from London up the east side of England to Scotland, with about 60 per cent of services starting or finishing at London’s King’s Cross station. Overall average rise for all East Coast fares from January 2 will be 1.21 per cent. Unregulated fares - which include off-peak fares and advanced-purchased tickets for leisure travellers - will go up by an average of 0.83 per cent. But regulated fares, which include season tickets, are rising by the recently-agreed 3.1 per cent average which is in line with the July 2013 RPI inflation rate on which the January 2014 national rises are based. This follows the announcement in Chancellor George Osborne’s recent Autumn statement that January 2014’s rail fare rise for regulated fares - which include season tickets - would be capped and limited to the retail or RPI rate of inflation rather than ‘RPI plus 1per cent’. The rises will now be based solely on the inflation-rate rate in July 2013, which means that the average rise in January 2014 will be 3.1 per cent rather than the expected 4.1 per cent. However, train operators still have flexibility to increase fares by a further 2 percentage points to 5.1 per cent, - provided other fares fall to compensate and keep the overall average at 3.1 per cent. Mr Osborne said his decision would benefit more than 250,000 annual season ticket holders who will, on average in 2014, save £25. And TSSA transport union leader Manuel Cortes said other rail companies who have made ‘massive profits down the years from ripping off passengers’ should follow suit.